Minnesota Department of Natural Resources protects resource values - Managing invasive plants is a challenge under the best circumstances, but when coupled with high recreational use, miles of trails and diverse ecosystems, it becomes even more complex. Chris Weir-Koetter, Strategic Program Manager for the Minnesota Department of Natural Resources (MNDNR) Northwest Region Parks and Trails credits careful planning, persistence, and integrating the most effective and selective methods for her success in managing spotted knapweed (Centaurea stoebe). “Our agency is charged with conserving and managing Minnesota’s natural resources,” Weir-Koetter explains. 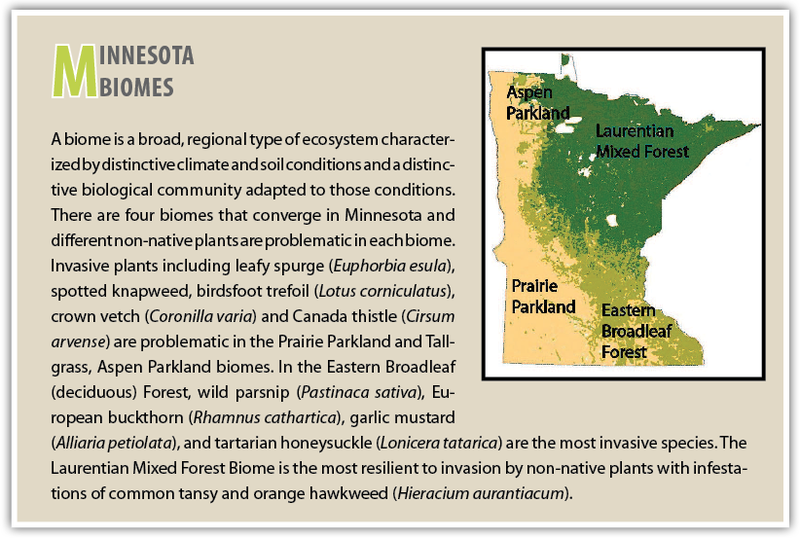 “We have very diverse vegetation in Minnesota with four of North America’s biomes converging in the Northwest Region.” The Region encompasses 16 state parks, recreation areas and wayside areas containing over 70,000 acres. There are 200 miles of state trails and 700 miles of state water trails along with hundreds of public water access points. Ecological diversity combined with invasion pathways and recreational use means plenty of suitable habitat for a variety of nonnative plants. Spotted knapweed is among the top ten invasive plants prioritized for management by the Northwest MNDNR. First observed in the Northwest Region in Clearwater County in 1997, the weed spread rapidly along road corridors, trails, and in sand and gravel materials used in construction and maintenance activities. Currently all counties within the Northwest Region are infested with spotted knapweed including ten state parks. An integrated program to contain and control spotted knapweed was implemented in 1998. Methods included a combination of selective herbicides, mowing, biological control, hand pulling, and grazing. Different management strategies were customized for individual state parks based on the size and location of weed infestations, operating budgets, and environmental constraints. A resource field crew trained for invasive plant management conducts most of the control efforts with support from parks and trails staff. Treated sites are monitored periodically to determine effectiveness of various management methods, and to locate and treat new infestations. Selective herbicide treatments included dicamba applied at 32 fluid ounces per acre (fl oz/A), Milestone® at 5 to 7 fl oz/A, and Transline® at 10 to 16 fl oz/A. Herbicides were applied to spotted knapweed at the rosette to early bolt growth stage to remove plants and stop seed production. The higher herbicide rates were applied at later growth stages. Results of the herbicide treatments evaluated a year following application showed that dicamba gave less than 50% spotted knapweed control compared to Transline and Milestone with greater than 90% control. “Based on these results we adapted our program to use the most effective herbicide treatments,” explained Weir-Koetter. On sites where common tansy (Tanacetum vulgare) and spotted knapweed are growing together, Opensight® at 2 to 3.3 ounces of product per acre is providing good control of both species. The combination of both herbicides on one granule makes it easier for applicators to mix spray solutions and broadens the weed control spectrum. Although spotted knapweed seed remain viable in the soil for at least eight years, Weir-Koetter observed that growth of desirable vegetation increased following herbicide treatments and provided competition to germinating spotted knapweed. There are a few locations where desirable vegetation is not present prior to treatment. On these highly disturbed sites, the Northwest MNDNR Parks and Trails resource staff are restoring native and other desirable vegetation to help establish and promote a weed-resistant plant community. Persistent and careful hand pulling has been shown to control spotted knapweed if the entire crown portion of the plant is removed before the plant produces seed. Hand pulling spotted knapweed on MNDNR lands was effective on eliminating individual pioneer plants but had drawbacks when controlling larger infestations. Results of the MNDNR monitoring efforts showed that hand removal disturbed the ground and provided perfect conditions for spotted knapweed seeds to germinate. Pulling was also was very labor intensive with high control costs. These observations were similar to hand removal projects evaluated in Montana that showed hand pulling well established infestations of spotted knapweed twice each year cost about $14,000 per acre per year. Biological control can be an effective, long-term management tool for well-established infestations, but often requires many years before results are visible. At Glendalough State Park, the root-feeding weevil was released at multiple locations mainly along the edge of infested fields. The MNDNR is actively monitoring insect populations and is hopeful that biological control of spotted knapweed will play an important role in the management of spotted knapweed in northwestern Minnesota. “Another important part of our invasive plant program is to insure that our management efforts weren’t accelerating the problem,” says Weir-Koetter. The Minnesota DNR developed guidelines for preventing spread of invasive plants within their own agency. This includes cleaning equipment to reduce spread, requiring weed-free materials (sand, gravel), requiring contractors to enter a site with clean equipment, and inspecting and controlling weeds on stockpiled materials. State restrictions on the sale and use of Opensight and Transline apply. Consult the label before purchase or use for full details.